With a wide range of colours, shapes and sizes to choose from, we’ve got your award! 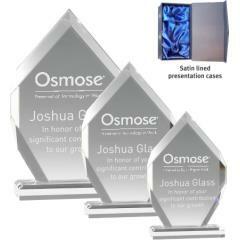 Give awards that truly stand out. 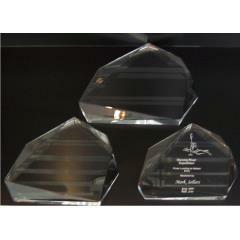 At Awards and Trophies, we specialise in acrylic and other clear awards such as crystal and glass, that are sure to impress the lucky recipients. 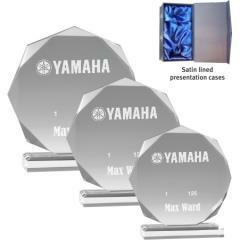 True showstoppers that are lightweight yet sturdy, these acrylic awards will stand the test of time. Choose from a fantastic range of sizes, colours and shapes – there’s bound to be an acrylic plaque or trophy to pique your interest! If not, just contact us to discuss your custom needs and enjoy Australia-wide delivery. I just wanted to thank you so much for your beautiful product. 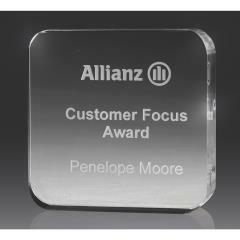 I received a Crystal Ice Peak by Rikaro for my nomination as a Finalist for Suncorp Aspire Awards. It is beautifully presented and I am so proud to show it off. Thank you again for such a breathtaking product.